GAMCOTRAP pays tribute and honours the late Honourable Aja Nyimasata Sanneh-Bojang, The Gambia’s first female elected Member of Parliament in the then Jawara regime and continued her stewardship with the second regime. The late Nyimasata was born to parents from the heart of the Kombos – Brufut and SukutaSabiji. young woman but quickly moved on to the teaching field. She started as an unqualified teacher but with determination she later qualified and taught in different schools in the Kombos and in the North Bank Region and rose to the position of head teacher. Being one of the rare role models at the time, especially from her Mandinka ethnic group, the then young Nyimasata engaged with the local social structures and became part of the peer group – “fulangkafo”. This availed her opportunity to sensitize her peers and encouraged them to engage into meaningful and gainful activities and development. As Public Relations Officer of the Women’s Bureau in the 1980s; she organized, sensitized and mobilized women to participate in all spheres of nation building mainly supporting the existing status quo. She held many portfolios as a politician, including the Minister of Health. She broke the barriers for women to participate in elective political position despite the rough and difficult terrain she faced during this process. During the first republic, she held the position of a Parliamentary Secretary. She also served as a Member of Parliament (MP) during the second Republic. Her charisma has been utilised by leaders to advance their political ambition and she has always been a staunch supporter of the APRC. She influenced the hearts and minds of people within her circle to support the ruling party. During her engagement with the current dispensation she was among those who led the campaign during the transition up to the election which ushered President Jammeh as the leader. During her career as a political figure, she engaged women and led the political arena for women in The Gambia. She was principled and very hardworking. Both the first and second regime owes this great woman appreciation for her contribution to Gambia’s development. She was one of the leading organizers of FGM in her communities; a practice she then believed was grounded in religion. With knowledge she was empowered to say “No” to FGM. Honourable NyimasataSanneh henceforth took a strong stance against FGM shaking off the cultural feathers she had. Her commitment to positive change earned her membership in the Board of Directors of GAMCOTRAP and has served from 2006 to 2015 when she met her demise. Her engagement with GAMCOTRAP sharpened her feminist lens. The late Honourable Sanneh chaired GAMCOTRAP’s four public declarations held between 2007 to 2013 in which circumcisers take an oath to abandon FGM in the Dropping of the Knife celebrations held at The Independent Stadium, Basse, Soma, and Wassu. 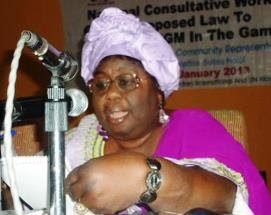 “Aunty Nyima”, as she was fondly called, was a board member of GAMCOTRAP and led the campaign to end FGM in the Gambia. The late Honourable Sanneh was very astute and courageous in standing up for her beliefs. When she learnt about the impact of FGM on women and girls, she was determined to fight the wrong meted on girl-children by openly supporting the crusade and joined GAMCOTRAP in its mission to protect women and children’s rights in general and FGM in particular. Being the first female political leader who earned her seat to the Parliament through the ballot box, the late Honourable Sanneh was an inspiration for women aspiring for leadership positions. She led GAMCOTRAP in a ground breaking project to promote the participation of women in Politics and Decision Making in 2008.
commented to the team “I will always give GAMCOTRAP my support and you can count on me. I believe in your mission and objectives and I will always be with you. I believe in the mission because the cause is genuine.” Her believe in women’s empowerment sometimes has cost her political relevance. Aunty Nyima was a charismatic leader who facilitated positive change for people wanting to realise their objectives whilst taking the back seat. She has mentored a lot of women’s groups and individuals to gain higher heights and supported them financially to reach where they want to go. She has promoted unity among people and traditional leaders and she is well known for her generosity to people. Her latest engagement was in promoting the cause of vulnerable women and girls when she organised and encouraged a group of young girls who she introduced to GAMCOTRAP to mentor them. In her own words she said “GAMCOTRAP I have entrusted these girls to you to give them all the support because I believe in them.They are trying all their best to live a decent life and it is not easy for them.” These are the V-Girls. We know that there are many other initiatives she has undertaken and we pray that her dreams for Gambian Women will be realized. She is survived by her sons, daughters and grand children. Aunty Nyima, you have done a lot for the Gambia. May Allah grant you the highest reward!